Our hand crafted made-to-measure Internal Plantation Shutters can be manufactured to suit even the most awkward and unusual window shapes and styles. For more information on each style contained within our extensive range, please click on the style menu below. Full height Shutters are single panels that run from the bottom of your window or door recess to the top. The addition of a mid-rail provides more flexibility. This provides the perfect solution for privacy problems; by closing the lower section of blades you achieve a level of privacy, whilst the light still filters through the top panels. Tier-on-Tier Shutters will look very similar to Full Height Shutters but offer the flexibility of being able to use the top and bottom panels independently. We have an extensive range of Shutter options to suit most Bay Windows. The cafe Shutter generally covers half the height of your windows, or finishes at the height of a glazing bar. They can be combined with a softer option on the top half of the window. 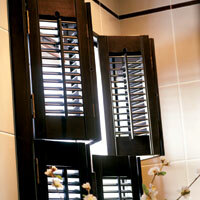 Our Bi-Fold Shutters are a great solution for long stretches of windows or doors. Bi-Fold shutters are designed to concertina together along track systems. Our By-Pass Shutters are another track system. The Shutter panels are situated on top and bottom tracks and slide past each other. This style of Shutter is suitable for room dividers, wardrobe doors or simply a privacy screen. Solid panel Shutters provide a more traditional look. Our solid panel Shutters are available in several styles, including Solid Shaker and Solid Base Shutters. French Door Shutters fit directly onto the doors and will move with the door when you open or close it. We can also cut around the door handles to ensure a perfect finish. Adding shutters to your French doors enables you to enjoy a uniformed look for all your windows and doors. The flexibility of our Shutters means that we can deal with the most difficult or unusual shaped windows. We specialise special shapes, including port holes, triangles, arches and roof gables. Special shaped Shutters enhance what is already a feature.